February’s handicap saw another healthy group of runners head out for the last handicap run of the winter. The weather for the day started out beautiful, but having mentioned how nice the weather was in the email I sent beforehand, it proceeded to cloud over and get miserable 10 minutes before the event. 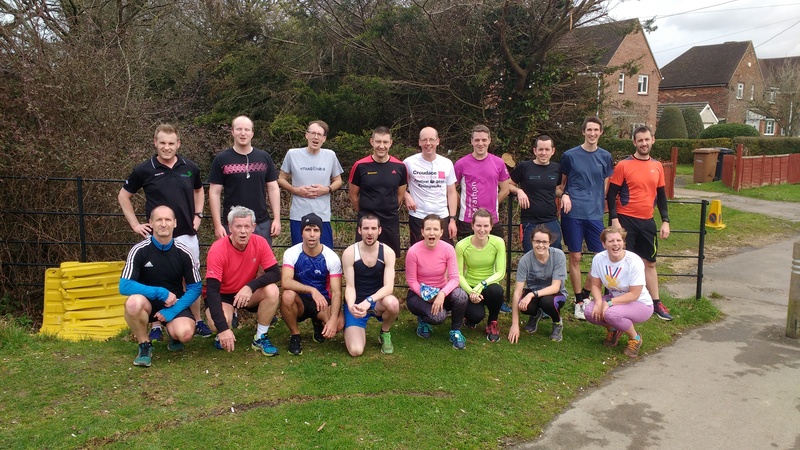 21 of you braved the chilliness and the brisk westerly. The cold breeze didn’t deter anyone though, as was shown with the number of PBs that were posted on the day. 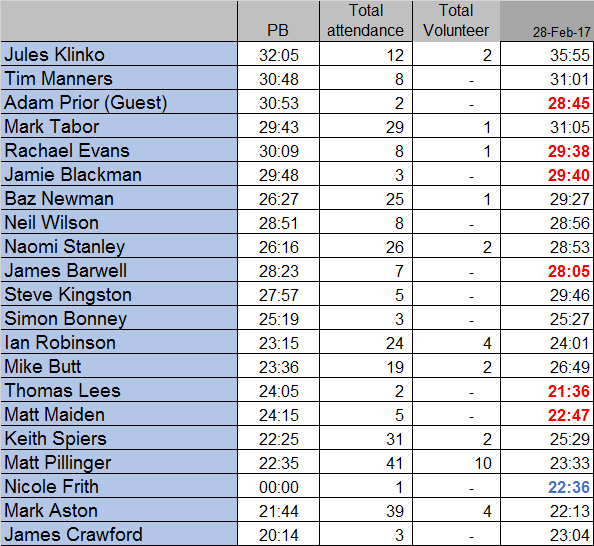 Congratulations to Adam Prior, Rachel Evans, Jamie Blackman, James Barwell, Tommy Lees and Matt Maiden (by 87 seconds!) who all improved on their best. Just missing out by 5 and 8 seconds, respectively were Neil Wilson and Simon Bonney. Next time! However, massive congratulations also go to Nicole Frith, who on her first run posted a fantastic time and took the women’s course record. Viv set the record on the first handicap and broke her own record twice, before Naomi took possession, also breaking her own record twice and in the process holding onto it for longer than anyone else so far. Laura then ran a storming 25:35 to depose Naomi. Karen got very close in July and September 16, before taking the Crown in October, becoming the first woman to run at under 7 min/mile pace. She held onto it for just 124 days and become our Lady Jane Grey (England’s shortest reigning monarch – just 9 days as our Queen). Today we anoint Nicole, long may she reign over us. 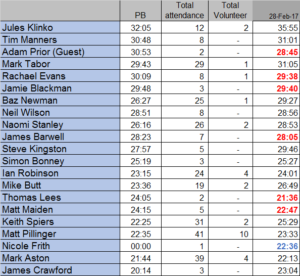 The men’s record is far less interesting, Paul Ashley took it in event 1 (24 April 2012), recording 20:20, lowered it to 19:20 by February 2013, where it has remained ever since. In the attendance records, Baz has extended his lead to showing up 18 times, that’s a solid 1 and half years of handicapness. Well done Baz. See you all out in March, when the handicap is in the diary for Monday 27th. By then the days will be longer than the nights and I’m sure the weather will be gorgeous. (I’ll never learn). This entry was posted in Handicap run on March 1, 2017 by James Clarke.